Puppy Training Tips Part 2: The word "NO"
Puppyhood is the most important time and the most critical time for your dog. What you do and what you do not do right now will affect your dog's behaviour forever. A properly socialized dog is well adjusted and makes a good companion. It is neither frightened by nor aggressive towards anyone or anything it would normally meet in day to day living. An unsocialized dog is untrustworthy and an unwanted liability. They often become fear-biters. They are difficult to train and are generally unpleasant to be around. Unsocialized dogs cannot adapt to new situations and a simple routine visit to the vet is a nightmare not only for the dog itself, but for everyone involved. Don't let this happen to you and your dog. Start socializing your new puppy NOW! The critical socialization period lasts up to about 12 weeks (3 months) of age. However, at 12 weeks, the puppy must continue socialization to refine its social skills. Socialization most easily occurs before the puppy is 3 months old. Any later than that and it becomes an excruciatingly difficult and time-consuming process that very few owners have the time, energy, money or patience to cope with. Invite friends over to meet your pup. Include men, women, youngsters, oldsters, different ethnic origins, etc. Invite friendly, healthy, vaccinated dogs, puppies and even cats to your home to meet and play with your new puppy. Take your puppy to the homes of these pets. This usually is preferable with dog-friendly cats. Do not put your puppy on the ground where unknown animals have access. This is where your puppy can pick up diseases. Wait until your puppy's shots are completed. Do not let your pup socialize with dogs that you don't know, that may not be vaccinated or who appear sick. I learned many years ago to eliminate the word "No" from my day-to-day dog training vocabulary. In the obedience classes I took with our first dogs, I was taught to save the word "NO" for life-threatening situations only, so I would be able to use it an emergency. The puppy who is caught chewing on an electrical cord would get an empathic "NO", as opposed to the puppy grabbing a slipper, where a gentler "Ah Ah" should do the trick. You do not want to be The Boy Who Cried Wolf once too often (or No in this case)! Rule #1 ... use "No" sparingly, and only if the pup or dog is doing something that really MUST be stopped (such as injury to itself or another). A dog who is raised by constantly hearing "No" for every misstep quickly learns to tune it out. Overuse of the word "No" also becomes frustrating for the trainer and can be demoralizing for the dog. A dog who is chewing on your antique coffee table is not in immediate danger (other than from you). Your coffee table is in danger! When training a puppy you KNOW that everything is brand new to them. You KNOW they don't come into this world already trained to do what you want them to, nor do they know what things you DON'T want them to do. Treat every problem as an opportunity to teach your puppy something. If you see a pup nibbling on something you don't want him to chew on, don't yell, "NO" like he's the biggest criminal in the world. Say, "Ah Ah" to get his attention, give him a toy or nylabone to chew on, praise him if he goes for the toy. If he goes back to chewing the wrong thing, try again, this time encouraging him to move farther away from the restricted object. Be patient. Be loving. Be firm. Be soft-spoken. TEACH, don't simply bellow. Rule #2 ... follow your "Ah Ah" or "Stop it" or "Leave it" or any negative type command with a positive command, such as "Sit" or "Down", or an informal "Here sweetie" or something, said PLEASANTLY, so that you can then PRAISE the dog for doing something right. Rule #4 ... mistakes are GOOD! 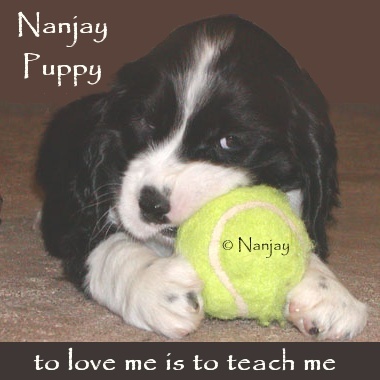 Mistakes made by the puppy or dog are opportunities to train, to teach. If the puppy only does bad things when you are out-of-sight and not there to supervise, then he's being given too much freedom before he is ready. You can "set up" situations where you can "catch him in the act", and then use that time to teach. If you feel you MUST use the word "No" for every little thing, at least vary the intensity at which it is spoken. "No biting", "No jumping", "No shoes", "No barking" ... there's SO many rules to learn! You don't need to completely crush a puppy's spirit for a simple misdeed or honest mistake. If the dog is not trained that's YOUR fault, not the dog's fault !!! I'm not an expert, but I am a firm believer in not yelling "NO" for the small stuff, and have been fortunate with all our Springers not to have needed to use that nasty word very often. "Ah Ah" has done the trick with all of our Springers over the years. Enjoy your pup. Teach him that it's always wrong to bite human skin and clothing. The time you spend training now will pay off for the life-time of the dog! Love is sharing your world with a gentle, sweet, trustworthy companion, who NEVER bites. Springers and other sporting dogs are soft-mouthed, meaning they usually don't bite hard. However, even with the sweetest pup on earth, you must teach him that biting is not acceptable ... ever ... especially when he is a puppy ... so he will NOT bite as an adult. All Puppies Bite (at first) If you watch a litter of puppies playing, you will notice that they spend much of their time biting and grabbing each other with their mouths. This is normal puppy behavior. When you take a puppy from the litter and into your home, the puppy will play-bite and mouth you. This is normal behavior, but needs to be modified so you and the puppy will be happy. The first thing to teach your new puppy is that human flesh is much more sensitive than other puppies and that it really hurts us when they bite. (Even if it doesn't hurt, you want the puppy to think it does!) This is called bite inhibition. - A puppy has very sharp teeth and a weak jaw. This means that the puppy can cause you to be uncomfortable when he's mouthing or puppy-biting you, but he cannot cause severe damage. - An adult dog has duller teeth and a powerful jaw. This means that an adult dog can cause significant damage when biting. The commands necessary to teach a puppy NOT to mouth, are easy and fun. Hold a small handful of the puppy's dry food, say "take it" in a sweet tone of voice, and give the puppy one piece of food. Then close the rest of the food in your hand and say "off" in that same sweet tone of voice. At first the puppy will NOT know what you are doing. Expect him to mouth and bite. He will try all his tricks to get the food. Remember, do NOT give a treat IF the puppy mouths or bites. You are in control of this vending machine, not the puppy! We are teaching the puppy that "off" means not to touch. You should do this with the puppy before every meal for at least 5 minutes. Unexpected mouthing (the times when you don't know the puppy is going to mouth, until you feel the puppy's teeth): say "Eye, eye, eye" or "OUCH!" Expected mouthing (you see the puppy getting ready to mouth you): say "OFF" before the puppy can mouth you. The puppy is mouthing you because of a desire to play. You have to answer the question, "Do I have time to play with the puppy now ?" If you do, then do "sit", "down", "stand" or other positive "lure and reward" training. If the answer is "No, I don't have time for the puppy, right now." then you need to do a time out (crate, or otherwise confine the puppy, so the puppy can't continue to mouth you and get in trouble. You will find the above much more humane than yelling at the puppy all of the time. FACT: ANY DOG WILL BITE GIVEN THE RIGHT CIRCUMSTANCES! If a small child suddenly falls on your sleeping adult dog; or accidentally (or intentionally) sticks a finger in the dog's eye, you should not be surprised if the dog's first impulse is to bite. It is instinctual and done out of fear or in self-defence. However, if you do a good job teaching your puppy 'bite inhibition', the worst you should get is a grab and release without damage. If you haven't done a good job of teaching 'bite inhibition', you may get a hard bite with significant damage. 1. Reprimanding alone will never stop biting. 2. If no respect exists, the biting will get worse. If you act like a littermate, the dog will treat you as one. 3. If trust is not there, the dog will eventually bite out of fear or lack or confidence. 4. Inconsistency sabotages training. If you let the dog bite some of the time, then biting will never be completely eliminated. 5. Don't forget follow up. The dog must understand that it is the biting that you don't like, not the dog itself. Make up afterwards, but on your terms, not the dog's. Most owners wait until a bite just "happens to occur" before trying to deal with it and are therefore totally unprepared when it happens, then do all the wrong things, thus making the problem worse. Dogs must learn to inhibit their bite before they are 4 months old. Normally, they would learn this from their mother, their littermates and other members of the pack. But, because we take them away from this environment before this learning is completed (often between 8 - 10 weeks), we must take over the training. By allowing your puppy to socialize with other puppies and socialized dogs (in a safe manner, having had vaccinations) they can pick up learning where they left off. Puppies need to roll, tumble and play with each other. When they play, they bite each other everywhere and anywhere. This is where they learn to inhibit their biting. This is where they learn to control themselves. If they are too rough or rambunctious, they will find out because of how the other dogs and puppies react and interact with them. This is something that happens naturally and it is something we cannot accomplish nearly as well. It can only be learned from trial and error. There is nothing you can say or do to educate them in this realm. They must learn from their own experience. Another major advantage of dog to dog socialization besides the fact that it will help your dog to grow up not being fearful of other dogs is that they can vent their energy in an acceptable manner. Puppies that have other puppies to play with do not need to treat you like littermates. So the amount of play-biting on you and your family should dramatically decrease. Puppies that do not play with other puppies are generally much more hyperactive and destructive in the home as well. A major cause of grown dogs biting is due to lack of socialization. Lack of socialization results in fearful or aggressive behavior. The two major reactions a dog has to something it is afraid of is to avoid it or to act aggressive in an attempt to make it go away. This is the most common cause of children being bitten. Dogs that are not socialized with children will bite them. The optimum time to socialize is before the dog reaches 4 months. With large breed dogs, 4 months may be too late, simply because at this age the puppy may already be too large for most mothers of young children to feel comfortable around. For most owners, the larger the dog is, the more difficult it is to control, especially around children. If there is anything you do not want your dog to be afraid of or aggressive towards, you must begin to socialize your puppy with them before it is 4 months old. There are many other reasons your dog will bite and you will have to take an active role in teaching them. However, before you can teach your dog anything, there are two prerequisites that are essential. They are trust and respect. If your dog doesn't trust you, there is no reason why he should respect you. If your dog does not respect you, your relationship will be like two 5 year olds bossing each other around. If your dog does not trust and respect you, then when you attempt to teach your dog something, he will regard you as if he were thinking, "Who do you think you are to tell me what to do?" Never hit, kick or slap your dog. This is the quickest way to erode the dog's trust in you. Yes, he will still love you. Even abused dogs love their owners. A unique characteristic of dogs is their unconditional love. You don't have to do anything to acquire your dog's love. But you must do a lot to gain your dog's trust and respect. Another area where we destroy our dog's trust in us is when we scold or punish them for housesoiling mistakes and accidents. When housetraining your puppy, there is never a right time to punish or reprimand. If you catch your dog in the act, say "AH AH" and quickly pick him up and carry him outside. When he does his business, praise him loudly. You have no right to scold him, because if he is going in the wrong place, it is your fault, not his. If you find an accident after the fact, just clean it up.